Climate change is having a profound effect on the millions of migrating birds that rely on annual stops along the Pacific Flyway as they head from Alaska to Patagonia each year. They are finding less food, saltier water and fewer places to breed and rest on their long journeys, according to a new paper in Nature’s Scientific Reports. The culmination of more than two decades of work in the six-state Great Basin, the study is a collaboration between researchers from UC Merced, Oregon State University, the U.S. Geological Survey and The Alliance for Global Water Adaptation (AGWA). because of the evaporation, wetlands have become saltier, which is dangerous for waterbird chicks. Waterbirds — including shorebirds, ducks, geese, swans, herons and rails — so reliably travel the same route every year that scientists and birdwatchers can predict which days they will arrive at wetlands around the Great Basin. The Basin includes a mosaic of wetlands that range from freshwater to salt lakes, providing birds with a variety of habitat choices throughout the year. Water for the wetlands principally comes from winter and spring snowmelt. 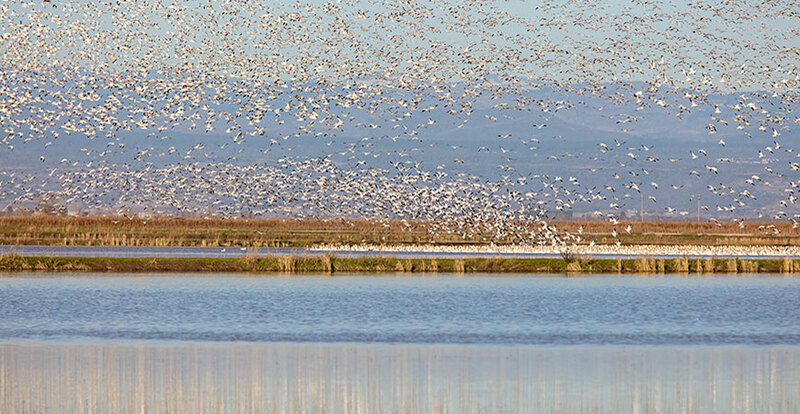 More than 2 million waterfowl pass through the southern Oregon-northeastern California region of the Flyway during spring migration, including at the San Luis National Wildlife Refuge Complex in the San Joaquin Valley. Other well-known California sites include the Sacramento National Wildlife Refuge Complex, Mono Lake and the Salton Sea. The wetlands used to provide rich food sources for the waterbirds but the changes mean some of the birds won’t make it. Oregon State Professor Susan Haig, the study’s lead author, spent 25 years studying the connection between climate change and the Flyway’s habitats. White pelicans are one of the many species affected by climate change's impact on the wetlands. Photo courtesy of Susan Haig. Changes in climate from 1980 to 2015 have affected the entire ecosystem of the Great Basin over the past 35 to 40 years, causing changes in the whole bird community, not just one species, the authors said. Birds’ entire migrations can be affected by having less water flowing into the wetlands because they have fewer areas to breed in the winter; less food and water for the journey, fewer safe places to raise chicks and a shorter migrating season. In addition to lack of snowmelt, summers in the Great Basin are getting hotter, drier and longer. Summer arrives earlier, reducing surface water. In this study, the researchers found mean annual minimum air temperatures increased in the Great Basin from 1900-2008, but significantly increased from 1980-2008, with the greatest seasonal increase occurring during the summers. Precipitation changed only marginally from 1900-2008, but from 1980-2008 the majority of the region became drier. Drier summers make saltier wetlands. But waterbird chicks need to be raised in fresh water because their salt glands aren’t developed enough to survive in salty environments. The researchers examined more than a century’s worth of temperature and precipitation data in the Great Basin, which spans nearly all of Nevada, much of Oregon and Utah, and portions of California, Idaho and Wyoming. They compared the data with results of U.S. Geological Survey Breeding Bird Surveys, which began in 1968. Prior research determined a 70 percent decline in shorebird populations since 1973, and more than half of the nine most important western salt lakes for birds have diminished by 50 to 95 percent over the past 150 years. The research showed significant associations between climate and bird abundances. “We need to actively watch and manage these critical natural habitats and perhaps invest in creating additional temporary wetlands that improve habitat but also provide other benefits — for example intermittently flooding rice fields and other farmlands — to offset climate impacts,” Safeeq said. “Several federal, state and local partners are already investing in research and incentivizing waterbird-friendly conservation practices, but not enough to keep up with the degrading water quality as temperatures continue to rise."